Mice Watch Movies To Reveal The Workings Of Consciousness : Shots - Health News Researchers in Seattle have created a public observatory for studying the visual circuitry in a mouse's brain. Among the attractions: watching 18,000 neurons respond to Orson Welles' Touch of Evil. 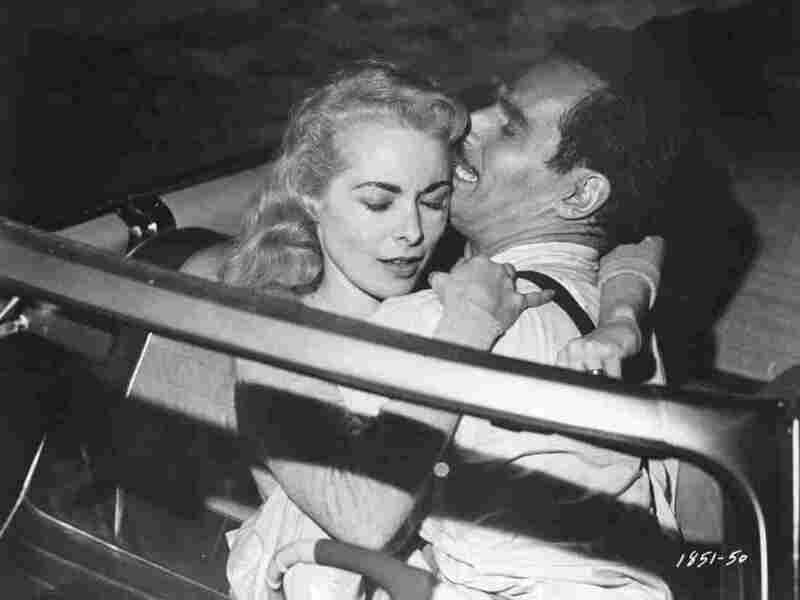 Lucky laboratory mice got to watch scenes from Orson Welles' classic Touch of Evil, starring Janet Leigh and Charlton Heston. Letting mice watch Orson Welles movies may help scientists explain human consciousness. At least that's one premise of the Allen Brain Observatory, which launched Wednesday and lets anyone with an Internet connection study a mouse brain as it responds to visual information. "Think of it as a telescope, but a telescope that is looking at the brain," says Christof Koch, chief scientific officer of the Allen Institute for Brain Science, which created the observatory. 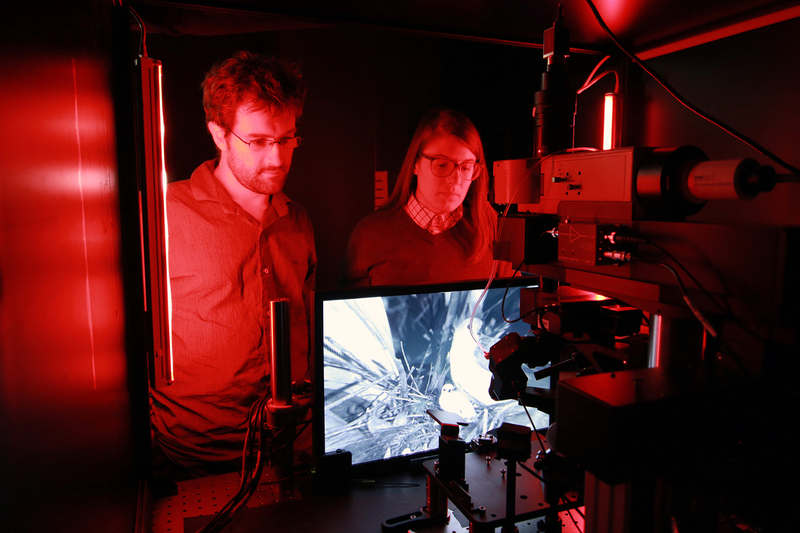 Senior scientist Jerome Lecoq and research associate Kate Roll of the Allen Institute inspect one of the microscopes used to record cellular activity in the visual cortex of mice as they watch movies. The hope is that thousands of scientists and would-be scientists will look through that telescope and help solve one of the great mysteries of human consciousness, Koch says. "You look out at the world and there's a picture in your head," he says. "You see faces, you see your wife, you see something on TV." But how does the brain create those images from the chaotic stream of visual information it receives? "That's the mystery," Koch says. There's no easy way to study a person's brain as it makes sense of visual information. So the observatory has been gathering huge amounts of data on mice, which have a visual system that is very similar to the one found in people. The data come from mice that run on a wheel as still images and movies appear on a screen in front of them. For the mice, it's a lot like watching TV on a treadmill at the gym. But these mice have been genetically altered in a way that allows a computer to monitor the activity of about 18,000 neurons as they respond to different images. "We can look at those neurons and from that decode literally what goes through the mind of the mouse," Koch says. A snapshot of the mouse visual cortex at the cellular level, captured by two-photon microscopy. 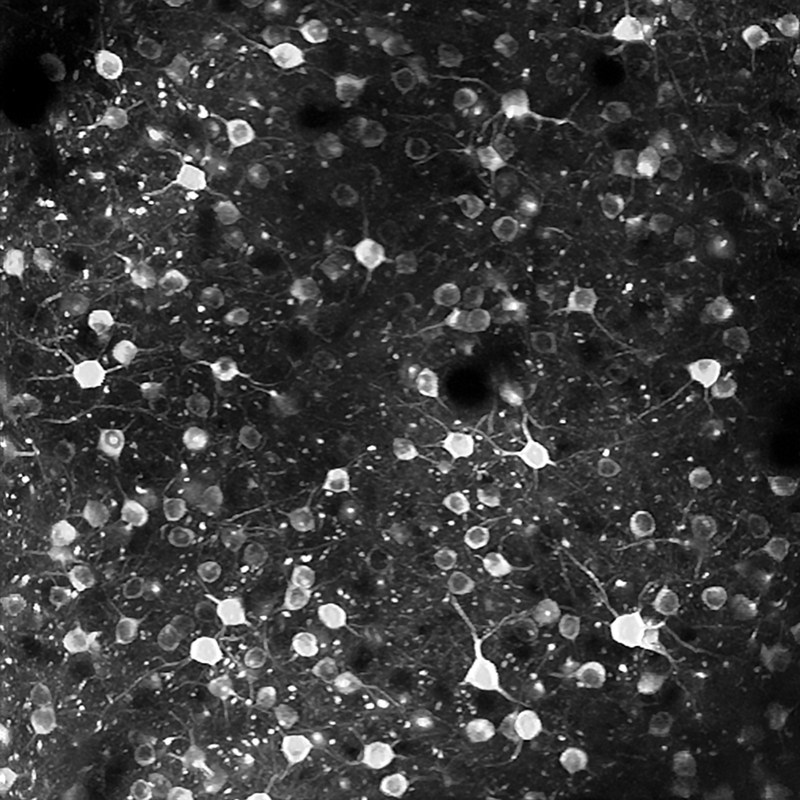 Those neurons were pretty active when the mice watched the first few minutes of Orson Welles' film noir classic Touch of Evil. The film is good for mouse experiments because "It's black and white and it has nice contrasts and it has a long shot without having many interruptions," Koch says. At one point, the camera follows a couple through the streets of a Mexican border town. As a mouse watches the action, its brain activity changes in response to the images. For example, brain cells that respond to vertical lines start firing as the couple moves past a building with vertical columns. That response is just one tiny part of the brain system that allows a mouse to create an internal map of its world. Other experiments show which brain cells fire when a mouse recognizes another animal, like a butterfly. By making all of this data publicly available, scientists around the world can test their own ideas about the nature of perception and experience and even consciousness, Koch says. "And we expect like in astronomy or other fields of science that they themselves will uncover things in our data that we never suspected." Future versions of the observatory will explore nonvisual areas of the mouse brain, Koch says, including those involved in making decisions.